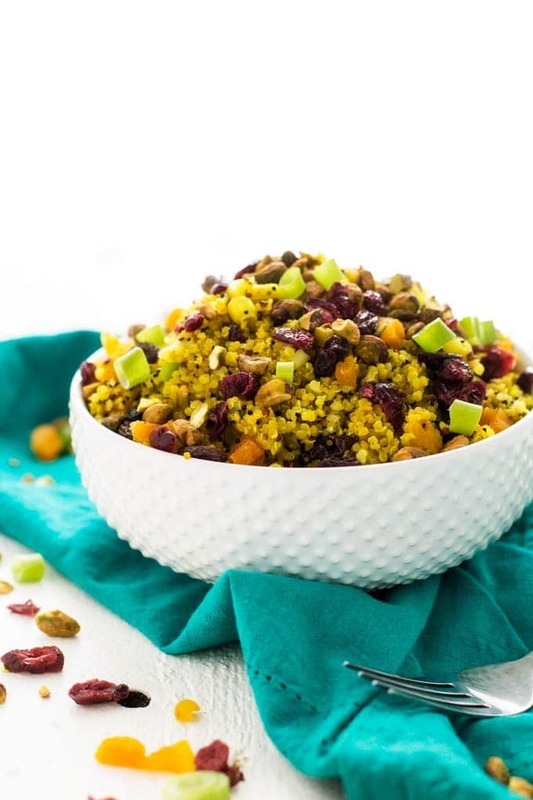 Jeweled Quinoa Salad - A Vegan Quinoa Salad that Everyone Will Love! 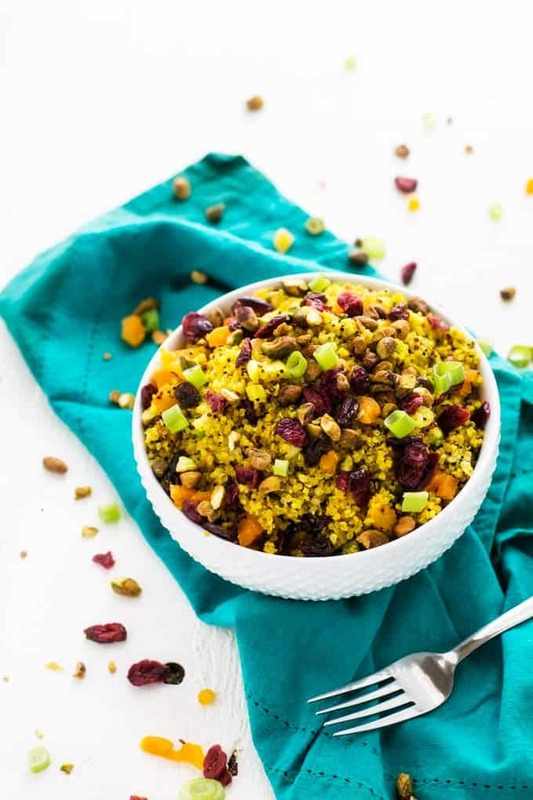 This Jeweled Quinoa Salad is a versatile quinoa salad recipe that works well as a holiday side, but is simple enough for every day. Beautiful, delicious and nutritious! I never put recipes that I don’t like on the website, but some of them hold a special place in my heart. This Jeweled Quinoa Salad is one of them. 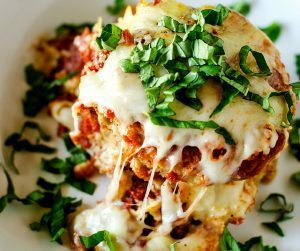 I created this recipe almost seven years ago, and it is still one of my favorites. I have lost track of how many times I’ve made it, but every time I do I wonder why I don’t make it more often. I love everything about it – the colors, the texture, and the taste. I would argue that it is pretty enough for your holiday table! Don’t you love how turmeric colors quinoa? 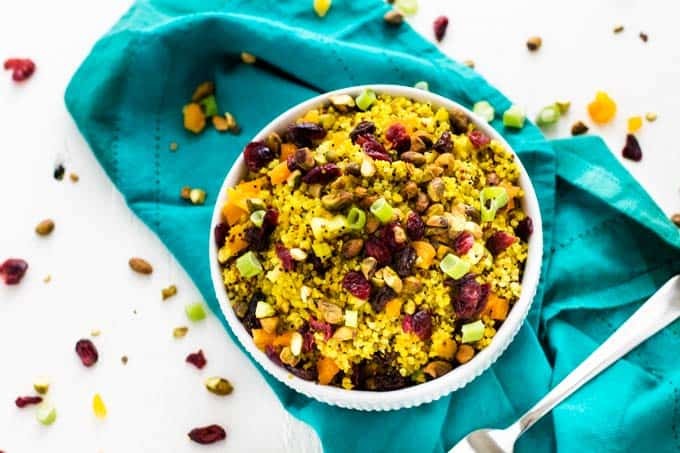 The combination of turmeric, quinoa, and pistachios turns this vegan quinoa salad into a meal that will keep you fueled without weighing you down. I don’t know about you, but I need all the help I can get this time of year. This healthy and delicious quinoa salad is perfect for breakfast or lunch. 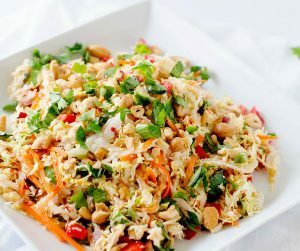 It also makes a great side dish for a more hearty meal. 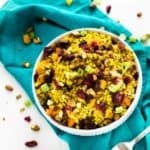 I have to say that this is one of my favorite vegan quinoa salad recipes! Heat olive oil in a saucepan. Add the white part of the green onions, turmeric, and quinoa and sauté for 3 minutes. Add garlic and cook 1 more minute. Add vegetable broth, bay leaf, salt, and pepper. Bring to a simmer and reduce to low. Cover and cook 25 to 30 minutes. Remove from heat. Fold in fruits and cover. Allow to sit for 5 minutes. Stir in pistachios, green onion tops, and lemon juice. May be served warm, at room temperature or chilled. This looks tasty and so healthy. I need to try this recipe. 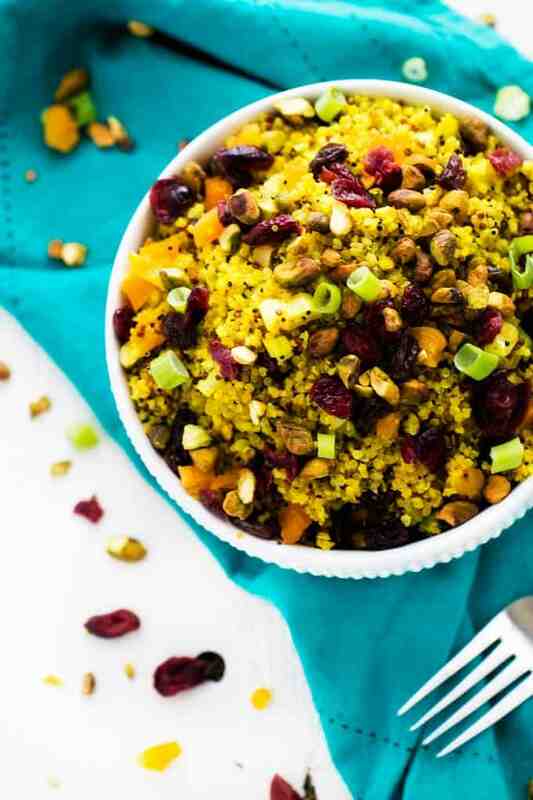 This colorful Quinoa Salad looks delicious! Easy to make. I’ll try it for sure. This quinoa salad looks so delicious! It’s perfect for vegan dinner date for us! I love how it has tumeric and has little spice to it. I remember when we ate in a restaurant and the only rice they offer is with turmeric. We are hesitant at first but it was so delicious. I believe this is delicious too. I like the color of this. Absolutely beautiful! I think “jeweled” is a great name for it. It does look like a dish fit for royalty and the name befits the colors. I will have to give this a try! 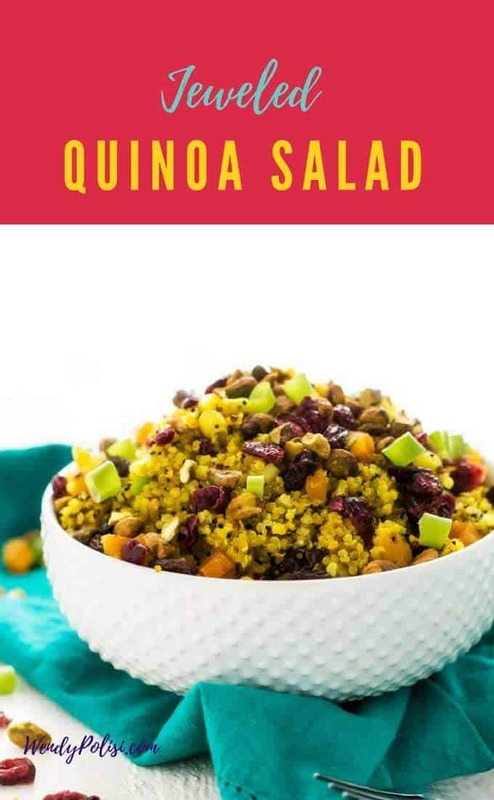 I’m newer to using quinoa but this looks amazing. I love the colors of it too! I’ve been wanting to make some quinoa for a while but didn’t really know what to do with it. This looks so yummy and doesn’t seem complicated at all. This looks so beautiful I can see why it’s called jeweledl! I love the color and quinoa is so yummy! Looks delicious! An alternative to salads our family normally has. I love the amount of color in this dish. Will have to try this – I like all the ingredients and I love you add in tumeric. I love quinoa. It’s a great replacement for rice!